The word Holodomor (Ukrainian: Голодомор) is the name given to the genocide of the people of the Ukraine in 1932-1933. The name literally means "murder by hunger". It is sometimes known as Ukraine's "forced famine" or called "Ukraine's Unknown Holocaust". Holodomor was a man-made famine carried out by Stalin and the Soviets to intentionally destroy the nationalistic Ukrainian people who posed a threat to the Soviet Union. The Soviets forcibly collectivized almost all of the Ukrainian farms in the "breadbasket of the world" and stole the peasants' food, thereby creating a devastating famine. Even though the man-made famine affected other areas, such as the Volga Basin and the Northern Caucasus, the term Holodomor refers specifically to the genocide of the Ukrainians. In 1930 collectivization began of the farms of Ukraine as part of Stalin's Five Year Plans. The Ukrainian peasants, who had a long tradition of private ownership of farmland, stubbornly resisted the Soviets efforts. The man-made famine was caused in part due to this resistance, and in part to destroy the Ukrainian people. The people were a danger to the Soviet Union due to their nationalistic aspirations, that is their desire for independence. At the time of the famine 1932-34, Ukrainian intellectuals, writers, teachers, and political leaders were also harassed, persecuted, and executed. The total number of deaths surpassed those of World War I. In the years 1930-1937, collectivization and famine killed up to 11 million people across the Soviet Union, including 6.5 million Ukrainians and about 3 million children. The 1932-1933 famine killed 5 million people in Ukraine, 18.8% of the population. At the height of the famine, over 25,000 people died every day, 1,000 an hour, or 17 a minute. Cannibalism was reported across the country. Holodomor was forcefully covered up by both the Soviet authorities and by various Soviet sympathizers in the West. At the time the genocide was committed, the Soviet authorities tried to keep any mention of it from coming out. Later, they kept any information from coming out from behind the Iron Curtain. Soviet historians tried to erase all evidence of this tragedy. They were aided by Western journalists like Walter Duranty of the New York Times, who not only helped conceal all evidence of Holodomor, but also called other journalists who reported on it liars. The lack of knowledge of this genocide was observed by English writer George Orwell, who commented "huge events like the Ukraine famine of 1933, involving the deaths of millions of people, have actually escaped the attention of the majority of English Russophiles". The Soviets managed to cover this up until Ukraine's independence in 1991. Official Soviet documents recently declassified revealed that the genocide was indeed intended to target the Ukrainian people. To this day there are still Stalinists and Russophiles who attempt to deny Holodomor was genocide, despite the fact that the governments of over 22 nations have officially recognized it as genocide. These countries are: Argentina, Australia, Azerbaijan, Belgium, Brazil, Canada, Colombia, Czech Republic, Ecuador, Estonia, Georgia, Italy, Hungary, Latvia, Lithuania, Moldova, Paraguay, Poland, Peru, Spain, U.S.A. and Ukraine itself. Also included is Pope John Paul II. In 2003, the 70th anniversary of the famine, Soviet sympathizers in the UN said the famine "ranks with the worst atrocities of our time" but did not use the word genocide. Russia still refuses to admit that it committed genocide. In 2003 the Russian ambassador to Ukraine, Viktor Chernomyrdin, said "We're not going to apologise... there is nobody to apologise to." The Russians were, however, well aware of what was really going on. One of Stalin's lieutenants claimed in 1933 that the genocide was working. He said it showed the peasants "who is the master here. It cost millions of lives, but the collective farm system is here to stay." In 1988, the U. S. Commission on the Ukraine Famine reported to Congress, confirming that genocide was committed. The fourth Sunday of November is officially Holodomor Remembrance Day. President Viktor Yushchenko has proposed a bill in Verkhovna Rada, Ukraine's parliament, to strengthen punishment for denial of Holodomor There are many memorials for Holodomor victims throughout North America and Ukraine, the most famous being in Kyiv(Kiev). Conquest, Robert. The Harvest of Sorrow: Soviet Collectivization and the Terror-Famine (1986). Davies, R. W., M. B. Tauger, S. G. Wheatcroft, Stalin, Grain Stocks and the Famine of 1932-1933, Slavic Review, Vol. 54, No. 3, Autumn 1995, pp. 642–657. Ellman, Michael. Stalin and the Soviet famine of 1932-33 Revisited, Europe-Asia Studies. Vol. 59, No. 4, June 2007, pp. 663–93. Ellman, Michael. The Role of Leadership Perceptions and of Intent in the Soviet Famine of 1931-1934, Europe-Asia Studies, Vol. 57, No. 6, September 2005, pp. 823–841. Ellman, Michael. Bitter Harvest, Hoover Digest, No. 1, 2008. Kohut, Zenon E.; Nebesio, Bohdan Y.; and Yurkevich, Myroslav. Historical Dictionary of Ukraine. (2005). 854 pp. Tauger, Mark B. The 1932 Harvest and the Famine of 1933 Slavic Review, Vol. 50, No. 1, Spring 1991, pp. 70–89 (argues that the harvest was unusually poor). Werth, Nicolas. 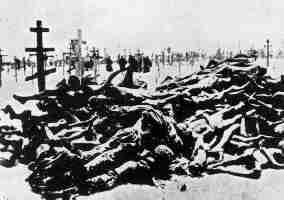 The Great Ukrainian Famine of 1932-33, Online Encyclopedia of Mass Violence, April 2008. Wheatcroft, Stephen G. "Towards Explaining Soviet Famine of 1931-3: Political and Natural Factors in Perspective," Food and Foodways, Vol. 12, No. 2, April 2004, pp. 107–136. ↑ Голод На Україні 1932-1933. Selected articles. Compiled by Nadia Karatnycky. Suchasnist, 1985. ↑ Robert Conquest, The Death Roll in The Harvest of Sorrow: Soviet Collectivization and the Terror-Famine. Oxford University Press, 1986. ISBN 0-19-505180-7. ↑ 8.0 8.1 Robert Conquest, The Harvest of Sorrow: Soviet Collectivization and the Terror-Famine. Oxford University Press, 1986. ISBN 0-19-505180-7. ↑ "Notes on Nationalism" in "The Collected Essays, Journalism and Letters of George Orwell" (London, 1968), Vol. 3, p. 370. ↑ Official statement of Pope John Paul II. Encyclopedia of Ukraine Entry "Famine"